Experience thrilling 5.1 channel surround sound along with easy setup and ease of use with the Denon AVR-E200 A/V receiver. It’s equipped with the latest Dolby and DTS high definition surround sound decoding that lets you enjoy the ultimate surround sound experience with your favorite DVD and Blu-ray movies and concerts. The on screen display combines clear text and easy to understand graphics – making setup a breeze and provides easy day-to-day operation. 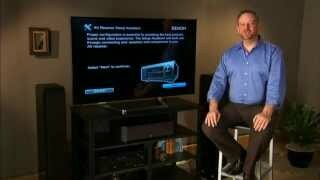 See what the experts are saying about the AVR-E200 Home Theater Receiver, here. 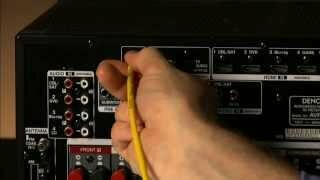 Via the text and graphical on screen display, you can easily make all necessary adjustments and settings during setup, to quickly and easily optimize the AVR-E200 for your particular speaker setup and compatibility with your source equipment. The speaker connections on the rear panel are color-coded for quick and easy connection, and the supplied color-coded speaker cable labels ensure correct hookup the very first time. 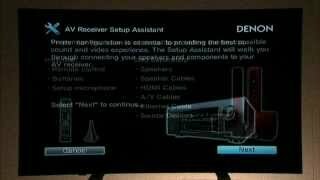 The AVR-E200 also features Denon’s easy to use Quick Select function, which provides 4 Quick Select buttons on the front panel and on the remote control that let you instantly choose from the Cable/Satellite, Blu-ray, Game and Aux inputs, and you can customize each one with your preferred sound settings for that particular source and then they’ll be remembered each time. A hallmark of Denon’s legendary sound quality is the use of identical power amp circuitry for all channels, including our all-discrete power amplifier output stage design. Rated at a maximum of 165 watts for each of the 5 channels, the AVR-E200 provides high power and wide dynamic range with low distortion for a superb surround sound listening experience. The AVR-E200 is equipped with 4 HDMI inputs, including 3 on the rear panel and 1 on the front panel, which lets you quickly and easily connect your HDMI-equipped camcorder, smartphone or other portable multimedia device. With HDMI Standby Pass-through, you can enjoy a program from your cable or satellite tuner on your TV without the need to turn the AVR-E200 on, which is ideal for casual viewing of newscasts and the like. With the AVR-E200, you can connect and enjoy just about any combination of speaker sizes and types, thanks to the variable crossover points which allow mixing and matching of differing speakers. You can connect compact speakers, standard-size speakers, even full size speakers as well as a subwoofer and optimize the settings for each type, based on their characteristics. The AVR-E200 is backed by a two-year limited warranty (one-year warranty on Refurbished model), subject to the full warranty terms and conditions. The receiver measures 6 x 17.1 x 12.6 inches (H x W x D). AVR-E200, remote control, 2 AAA batteries, FM antenna, AM loop antenna, CD-ROM Owner’s Manual, Quick Setup Guide, color-coded speaker label tags (5), warranty information sheet.